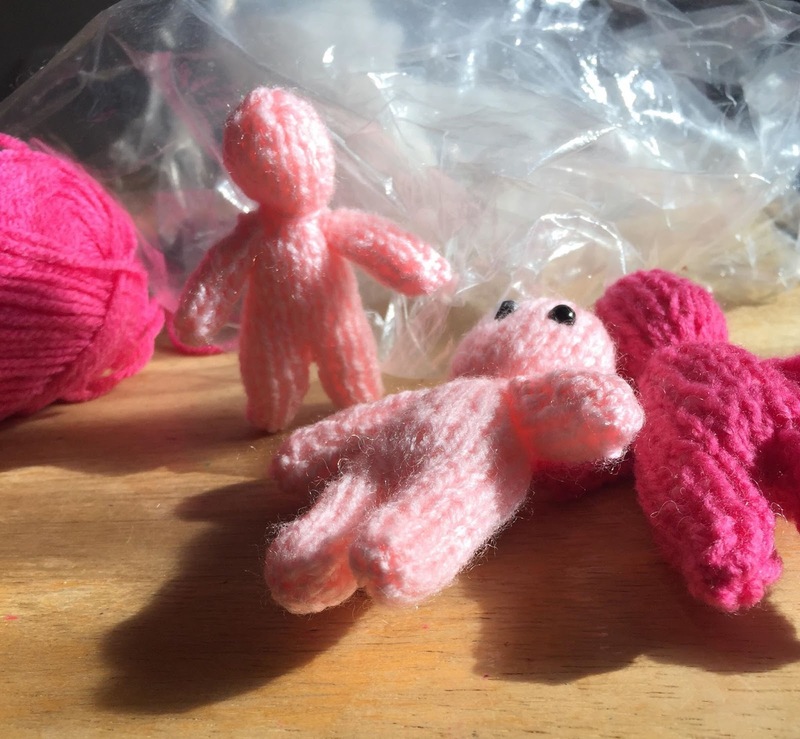 These little knitted poppets were made and photographed by artist and blogger Pat McNally. 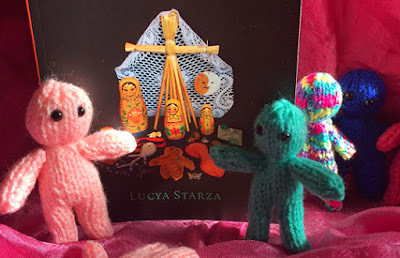 She used a pattern from my book Pagan Portals - Poppets and Magical Dolls after coming along to the talk I gave at Wicca Moon earlier this month. With this simple knitting pattern for a small poppet you knit the body all in one go, starting at one leg, then the other leg, then joining them together and knitting the body and head. The arms are knitted separately and sewn on. Use 4mm needles and double knit wool. You can use three cotton wool balls for stuffing, or a similar quantity of other material such as small pieces of fabric. Put hair, herbs and so on inside the middle of the cotton wool balls to keep them in place. Cast on 7 stitches. Knit 6 rows of stocking stitch then cut the wool and tie off the end, leaving a longish thread. Push the first leg to the back of your needle then cast on another 7 stitches. Knit 6 rows of stocking stitch again, then knit right across both legs – 14 stitches in total – for 14 rows in stocking stitch. Decrease by knitting two together until you have 7 stitches, then cut off a longish amount of wool, thread it through the 7 stitches and pull them tight to form the top of the head and tie off the thread. Cast on 6 stitches, knit 5 rows of stocking stitch, then cast off. Repeat for the second arm. Using the thread from the top of the head, sew up the back of the head and body to the top of the legs and fasten off the wool. Put two cotton wool balls (or other stuffing) into the body cavity. Poke any herbs, crystals or other items inside the middle of the cotton wool balls. Cut the third cotton wool ball in half and put half into the fold of each leg. Stitch between the crotch, then down and around the bottom of each leg. Loosely stitch around the doll between the two cotton wool balls, then pull the ends of the wool to gather in the stitches to form a neck, fastening them off. Fold the arms in half and stitch along the seam, then stitch each arm to the body. No need to stuff the arms. Poke the loose ends of wool into the doll’s body for neatness. Embroider eyes and any other features onto the doll afterwards. Pat runs workshops called Creative Path to Spirit at Woodford Spiritualist Church and also writes a great blog called Art from the Heart. You can buy copies of Pagan Portals - Poppets and Magical Dolls at Wicca Moon in Eltham, Treadwell's in Central London and order it from other pagan bookshops. I will be running a short workshop on poppets and signing copies of my books at the Henge Shop, Avebury, on Saturday 27 October as part of its Halloween Paranormal Weekend. 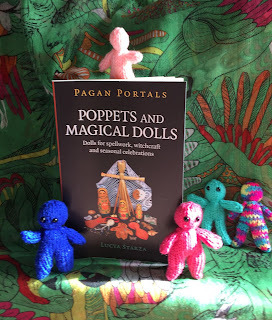 You can also view Pagan Portals - Poppets and Magical Dolls on Amazon. I have to thank Pat for pointing out a small mistake in Pagan Portals - Poppets and Magical Dolls. On page 15, under 'Legs and body' the pattern instructions should say to decrease by knitting two together instead of decrease by knitting twice into each stitch. Oops! I have corrected it on the pattern in this blog post and publisher Moon Books is going to make sure the correction is done for future print runs of the book. Brilliant talk at Wicca Moon in Eltham. We are really looking forward to Lucya workshop at Epping in November and we hope some of you will join us there. Watch our blog for details. Thanks for the comments and looking forward to running the workshop in November.